This 5-star hotel, located in the center of Manhattan, is only a 10-minute walk to Times Square. The elegant hotel features a 24-gym, on-site restaurant and in-room refrigerator. Each room at the New York Barclay InterContinental includes an iPod docking station and cable TV with a DVD player. A minibar and coffee facilities are also provided. The rooms are decorated in gold tones. InterContinental Barclay New York offers concierge services and a gym. Luxury shops and restaurants along Fifth Ave are just a 5-minute walk from the InterContinental New York Barclay. Central Park is a 20-minute walk from the hotel and Rockefeller Center is a 10-minute walk away. 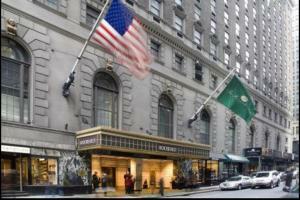 When would you like to stay at InterContinental New York Barclay Hotel ? This room features custom furnishings, a flat-screen TV, and a spacious bathroom. This twin/double room has a minibar, air conditioning and seating area. This double room has a bathrobe, flat-screen TV and seating area. This suite has a iPod dock, flat-screen TV and minibar. This double room has a minibar, bathrobe and iPod dock. This double room features a minibar, iPod dock and air conditioning. Guests are required to show a photo identification and credit card upon check-in. Please note that all Special Requests are subject to availability and additional charges may apply. Upon check-in photo identification and authorization of credit card for USD 100 per day is required and is refundable. Cash will be accepted if credit card is unavailable. Breakfast Included rates include breakfast for 2 guests only, irrespective of room occupancy. Each day we'll check prices and send you an email for your selected dates at InterContinental New York Barclay Hotel. If you don't have specific dates but would like to check prices for say next weekend or say next month we can check the price too. Click to write a review and share your experience of InterContinental New York Barclay Hotel with other travellers.